Sometimes, you do everything right to properly care for your oral health, but problems persist. 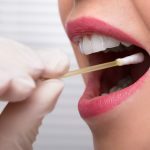 If you continue to struggle with gum and tooth problems despite good oral hygiene practices, it may be time for oral DNA testing. The test that we use here at Gladstone Family Dentistry is very easy to perform. In order to capture your DNA, we’ll ask you to swish with a formula and then spit it into a tube. The salivary sample is then set to a lab for testing. Another method uses a swab to wipe tissue samples off the lining of your inner cheeks. Help your dentist select the most effective treatment if you already have periodontal disease, and then measure results with a follow-up test. According to the American Dental Association (ada.org), “Saliva has long been considered a ‘mirror of the body’ that generally reflects the state of a patient’s overall health. A wide range of systemic diseases, such as diabetes and Sjögren’s syndrome, have oral manifestations that dentists encounter in patients at various stages of development. Based on these factors, dentists are ideally situated to monitor and treat oral disease progression, impaired salivary status, and various oral complications associated with systemic conditions.” They go on to say that advances in the science of oral fluid diagnostics may lead to the identification of genetic susceptibility to some conditions and more. So, if you’re giving your oral care routine your best efforts and still coming up short, let us peek into your oral DNA. The results may help us determine the best course of treatment to help you feel your best!